“A Time to Die” is one of the first books to be published by the newly branded Enclave Publishing House. It’s a very exciting time for Christian publishing. 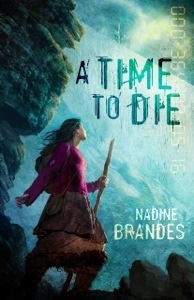 Admittedly I am not a fan of every new genre that Christian publishing houses have made room for, but I do have a certain fondness for the speculative and dystopian divisions and so I jumped at the chance to review and help promote “A Time to Die” by Nadine Brandes. I was blessed to have the opportunity to read and review an advance copy of this book. It is so refreshing to find a Christian author who writes dystopian… and it’s book 1 of a series so there’s more to come. The concept behind this book is fascinating. What would you do if you had one year left to live? What would you do with your life if you knew the number of days you had? The Bible tells us that no one can know how many days they have… but what if you did? What would you do? Would you want to see the world, fall in love, read every single book you could get your hands on? What if belief in God was frowned upon by society at large? What if all you had to look forward to was your number of days and then… nothing? Would you be inspired to do something fantastic? Or would you only be inspired to live a fantastic life if you had an AWESOME GOD to believe in? What she finds on the other side about the world, about eternity, and about herself changes Parvin forever and might just save her people. But her Clock is running out. Click below to learn more about the book AND the blog tour.